The last name spoken on their deathbeds by R. R. Lee and Stonewall Jackson was that of their great subordinate, A. P. Hill. Lee’s final words, “Tell A. P. Hill to come up” keynote the story of the Culpeper redhead and his hard hitting light division. For the Light Division always did come up at the critical moment to save the day for the Army of Northern Virginia. The gallantry and dash of Powell Hill’s Cavalier ancestors characterized his own career and death on the battlefield. He and his officers and men saw more frontline action than most of lee’s army. But their dreadful losses and other vicissitudes of campaigning left a searing imprint on the former U.S. Army captain whose normally friendly spirit had to be submerged by the stern requirements of combat leadership. In less than three years he rose to the rank of corps commander and at the end was Lee’s closets adviser. Hill’s officers and men returned the loyalty and esteem which he game them and, responding to the flame of his unquenchable fighting spirit, gave their utmost in battle. Hill’s Light Division bore the brunt on the Peninsula when Jackson faltered, saved the day at Slaughter’s Mountain, withstood formidable assaults on the army’s flank at Second Manassas, saved the day at Antietam. It distinguished itself in every major battle from Mechanicsville to Five Forks. 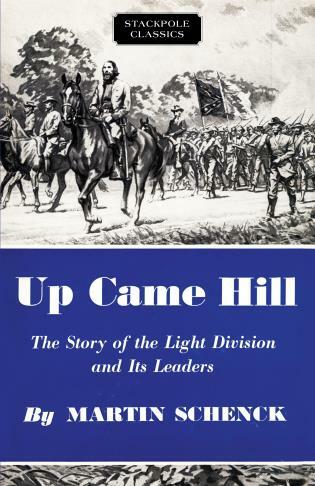 Up Came Hill is more than a combat story.Up Came Hill will afford deep satisfaction to the many Civil War buffs and others who value a clear account of the overall course of the war in the eastern theater together with a detailed exposition of some phases which have long been relatively obscure. It constitutes, to, an admirable and overdue tribute to an outstanding leader and to one of the grandest fighting units in which Americans have served. Martin Schenck was born November 2, 1912, at Albany, New York, the descendant of early Dutch settlers. He received his bachelor’s degree from Yale in 1934 and law degree from Albany Law School in 1937. He practiced law in Albany until 1943 when he entered military service. He rose from the rank of private in the infantry (78th Division) to captain, was assigned to the General Staff (GI) in the Pentagon, meanwhile graduating from the Armored Course at the Command and General Staff College at Fort Leavenworth. After the war, Judge Schenck took up the study of tactics as a hobby, especially of the Civil War. This resulted in numerous visits to the battlefields of Pennsylvania, Maryland, and Virginia, and a deep study of the Official Records and other sources. A. P. Hill impressed Schenck as being a great and colorful figure whose career had been largely overlooked by writers, and this induced him to undertake the research and writing which resulted in this book. Schenck is now a prominent jurist; he served as Traffic Court Judge for Albany from 146 to 1950 when he was elected Albany County Judge. He is now serving his second term in that office. Mrs. Schenck is the former Barbara Archibald of Albany; she shares in the author’s interest, research and trips to the Civil War locale. Judge Schenck is a member of several veterans’ organizations and of the Civil War Round Table of New York City. He is a past president of the New York State Association of County Judges, and attends the First Church of Albany, Dutch Reformed. Aside from his Civil War interest his main hobby is golf, which he plays in the high 70’s.